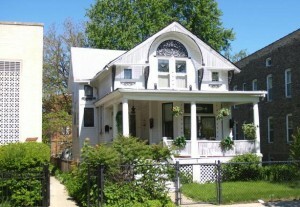 Posted in: A Walking Tour of Old Ravenswood. Tagged: 1885 structures, 4323 N Paulina St., Amelia Pettie, Levi Pitner, William Pettit. A gingerbread cottage, with wood cut-out filigree work in west gable and brackets, wood slat work in gable. North facade has gable which follows the west facade. Note stained glass in first–floor bay window transom. Porch was added in 1926. Levi Pitner, a local developer, built a simple cottage on this site for Amelia and William Pettit in 1885. Between 1894 and 1928 it was replaced or was substantially altered and enlarged. CCL Survey; Recorder of Deeds Office. only permit is sundry permit for porch addition on 4/14/1926 (Permit #78751; File 132265). 1880 Census. Continue the tour to 4332 North Paulina Street, the Ravenswood Elementary School. The next building is the school across the street, about 343′ from you.